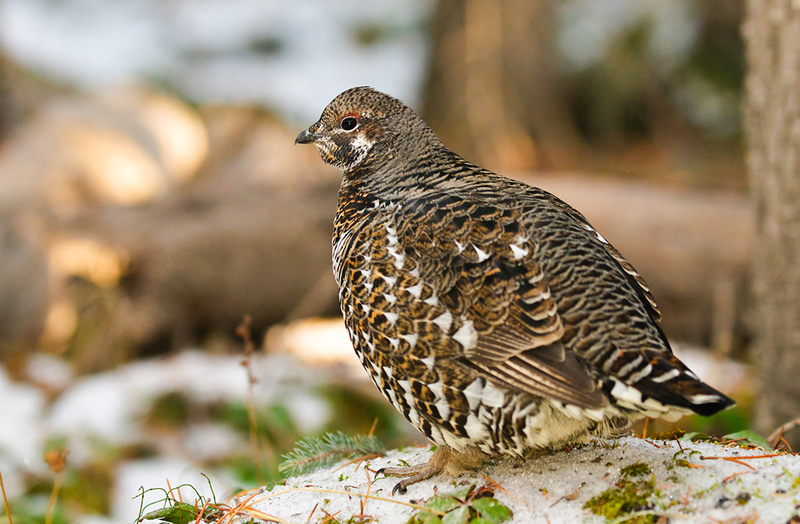 In this week’s column, Stan Tekiela takes us deep inside the northwoods of Alaska in search of a hard-to-spot bird, the spruce grouse. Deep in the northwoods of Alaska, and stretching eastward to the dense conifer forests of Maine, lives a bird that superficially looks and acts more like the familiar Eastern Wild Turkey. 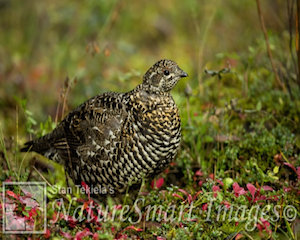 It is the Spruce Grouse (Falcipennis canadensis), also known as the Fool Hen, Black Partridge, Canada Grouse, and Spotted Grouse. Standing about 15-17 inches tall, it’s a good-size bird. You would definitely notice it if you saw it, not like those small, brown, nondescript birds. It resembles a chicken or perhaps a miniature turkey. Some who might be familiar with the Ruffed Grouse might also be confused. But the Spruce Grouse is much darker then the brown Ruffed Grouse. Male Spruce Grouse are nearly black with large white spots on their sides and belly. They have a bright red patch of skin over their eye called a comb. During spring and late fall, the males will fan their tail just like a turkey and strut about, trying to impress the females. 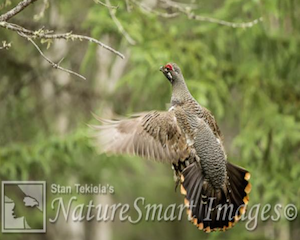 During the spring courtship, the male Spruce Grouse displays on a dancing ground. He usually has about three or four favorite perches. Starting at one perch, he will often flutter his wings and fan his tail. Quickly he jumps down and walks across the dancing ground to the next perch. He flies up to the next perch and does a similar display, looking around for any females that might have noticed his incredibly visual display. He will move to the next perch until he has completed his circuit, and then he starts all over again. If he has displayed well enough and attracted a female, he will fly down, landing near her, and start to strut. First, he fans his tail at a 70- to 90-degree angle, exposing his white-tipped undertail feathers (coverts). He droops his wings and raises his head straight up and high just like a turkey. At this point his bright red combs above his eyes become engorged with blood, swelling to twice their normal size. Believe me, this is a very impressive display. Sometimes the male will rush towards the female, lowering his head and suddenly flicking his tail up with a whooshing sound. It’s very impressive, indeed. 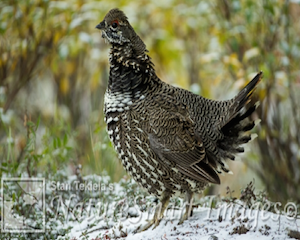 On my recent trip to central Alaska, I spent a lot of time studying and photographing Spruce Grouse. I always find it interesting how each bird is a unique individual. Some are fearless and allow me to approach them and take great images, while others will bolt out of sight the moment they see me. Because I was there at the end of summer, a time of year when no breeding occurs, the male Grouse were doing their false display. The males were not in full breeding plumage; even though they fanned their tails and followed the females around, there was no actual mating going on. To see courtship behaviors outside of their normal spring mating time is fairly common. Nearly all birds suffer from something called gonadal recrudescent each autumn. This happens when the photo period or the amount of daylight from sunrise to sunset matches the same time during spring. For a very short period of time, a little more than a week, the males are often tricked into thinking it’s spring again. The females seem to know it’s not really breeding season and just let the males show off, without showing much interest. The spruce forests in central Alaska are carpeted with a thick, spongy layer of plants. Each of my footsteps sinks 8 to 10 inches deep. Thousands of mushrooms pop up all over the forest floor. The spruce trees rarely grow taller than about 20 feet due to the harsh winters. The Spruce Grouse finds this a perfect habitat. Walking around without making a sound is easy when you are walking on a thick carpet of plants, making it easy for me to sneak up on the grouse.